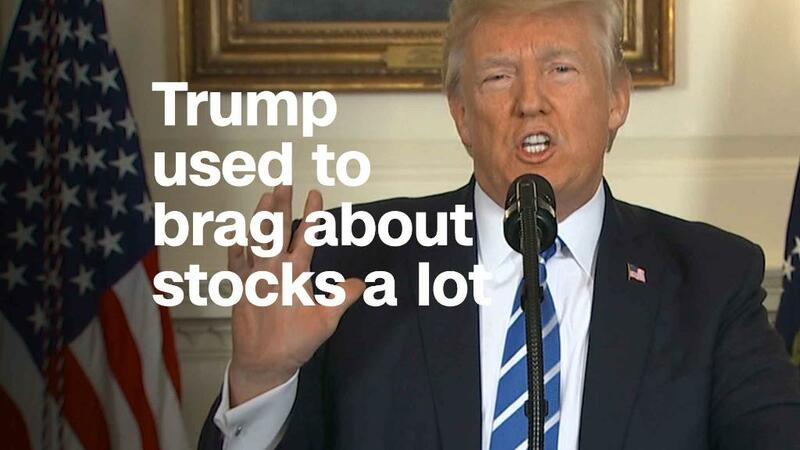 President Trump doesn't sound happy with the stock market. He broke his silence Wednesday about the market turmoil: "In the 'old days,' when good news was reported, the Stock Market would go up," he wrote on Twitter. Trump's complaints came two days after an awkward split-screen moment: The Dow was plunging more than 1,000 points just as he was giving a televised speech touting the economic benefits of his tax plan. Wall Street's darkest day since 2011 put the president in a tough spot because he took so much credit for the market's big gains after he was elected. He has a point about good news and bad news: The market did indeed plunge in recent days after positive economic news. Though that's not a new thing -- it happens from time to time. And there is some logic behind it, even if it's frustrating to presidents and everyday investors alike. Consider the rude reaction on Wall Street to Friday's jobs report, which showed that wages grew at the fastest pace since 2009. That's a clear win for Main Street after years of weak pay increases for workers. Yet the stock market had a hellish day. The Dow plunged 666 points, or 2.5%, its worst day in more than a year. Wall Street was focused on the short term. Investors worried that wages could grow so quickly that they will put a dent in record corporate profits and make the Federal Reserve nervous about inflation. "We're back in this perplexing phase where good news for the economy is treated as bad news for financial markets," said Candice Bangsund, portfolio manager at Fiera Capital. If the Fed aggressively raises interest rates to fight inflation, it will remove one of the drivers of the bull market. Because of that fear, investors sold bonds, which drove yields to four-year highs. Higher yields make risky stocks look less attractive by comparison. Thus the sell-off. So in that sense, Trump was right: Good news for Main Street was viewed as bad news by Wall Street. But this happened under Trump's predecessors, too. More than once under President Barack Obama, Wall Street became nervous that good economic news would force the Fed to raise rates. And in other cases, the opposite happened: Bad jobs news drove stocks higher because it meant the easy money wasn't going anywhere. This inverse reaction was so common that sometimes, as with a strong jobs report in August 2016, it was noteworthy that good news was treated as good news. Of course, the recent market turbulence is about more than the good news/bad news situation Trump alluded to. The stock market boom since Trump's election became overheated. Euphoria set in, making the market more vulnerable to sharp setbacks. A cool-off period was long overdue -- and may prove to be a healthy thing. "Markets do better over the long term when they experience corrections periodically," Capital Group CEO Tim Armour said in a recent report. "They can't go up all the time." In the past, Trump himself loudly cheered for the market to keep rallying. After the Dow hit 20,000 in early 2017, he said "Now we have to go up, up, up." It was a big reversal from during the 2016 campaign when he called the market a "big, fat, ugly bubble."